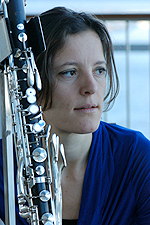 On April 18, 2013, bass clarinetist Fie Schouten performs the musical composition article 7 [seven ways to climb a mountain] (2012) by Rozalie Hirs as part of the series Handmade Homegrown in Theater Dakota, The Hague. The event is curated by Australian composer Kate Moore. Kenneth van Zijl interviews Rozalie Hirs on her poetry and her music for the De Schrijfkamer segment of the Knetterende Letteren television program.